4 August, 2017, Bukowina Tatrzańska (POL): Dylan Teuns showed he is in the form of his career by claiming the overall win at the Tour of Poland in an impressive display of strength and determination across the seven days of racing. 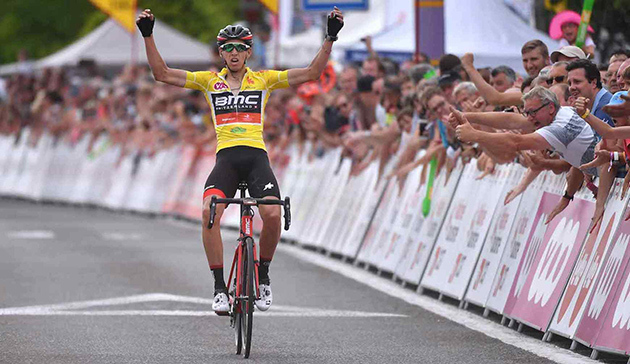 Teuns lined up for stage 7 with a slim 6-second advantage and with the top 12 separated by 43 seconds, BMC Racing Team was prepared to do everything possible to defend Teuns' yellow jersey. An early move on the 132km stage, forced by Peter Sagan (Bors - hangrohe), saw 13 riders go clear, but with no-one threatening the overall lead of Teuns, BMC Racing Team was happy to allow the breakaway to build up an advantage of almost three minutes. As the breakaway headed up the unclassified 5km climb and crossed the finish line for the first time with 66.5km to go, the peloton had cut into their advantage by 30 seconds before a determined effort from UAE Team Emirates at the front of the bunch saw small gaps begin to form. 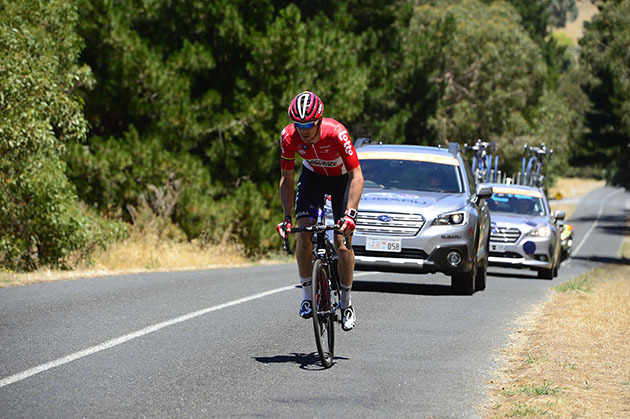 After the breakaway extended its advantage to back over two minutes, the chase began to heat up once again with Teuns well-positioned at the front, neatly tucked between Rohan Dennis and Tejay van Garderen as the race entered the final 50km of the day. Eventually just Sagan remained out in front and he was holding onto an advantage of 40 seconds over his closest chaser, Diego Rosa (Team Sky), with the reduced main bunch another 30 seconds back as he began the final categorized climb of the day to Ścania Bukovina. Dennis began to set the pace with 20km to go with another big effort at the front of the bunch before the attacks from Teuns' General Classification rivals began. Rafal Majka (Bora - hansgrohe), who sat second on the General Classification, made the first move with Teuns, alongside van Garderen who matched each one before a burst of acceleration from Wout Poels (Team Sky) to close the gap to Sagan saw Teuns lose touch with group. An impressive display of teamwork from van Garderen saw the American drop back to Teuns and help bring him back of the front group as they reached the descent towards the final rise to the line with less than 10km to go. Sagan attacked once again and was able to extend an advantage of 20 seconds as they reached the foot of the final climb but with attacks coming from the reduced General Classification group, Sagan was swept up with 2.3km to go. The battle was on in the final kilometer for the stage win and the overall victory but Teuns gave it everything he had to stay with the leaders and cross the line in fifth place, behind stage winner Poels, which was enough to retain the race lead by two seconds. Teuns' win caps off the best two weeks to date of the Belgian's career after winning stage 3 on the back of two stage wins and the overall victory at the VOO Tour de Wallonie. Congratulations, Dylan! Can you believe it? "No, I can't believe it. It still hasn't sunk in. It's unbelievable!" Talk us through the stage. How did you manage to stay calm? "This was the thing, to stay calm. We needed to control the top ten and take care at the start because it could be a little bit hectic. It went pretty well and a big breakaway went but there was nothing dangerous for us. UAE Team Emirates took control so we were able to sit behind them and leave the group four minutes ahead and bring them back to two minutes in the final and let them go for the stage win. But, it didn't go like this"
"We knew the last lap would be harder than the first one and it was climb after climb. I was still feeling good before the really steep climb but I knew when I was climbing that I was quite at the limit and then I found it difficult to recover for the second to last climb. It was a really hard moment for me. I was so lucky to have Tejay van Garderen with me. He was pacing but it was too hard so I called him back in the radio and he did directly and did a perfect pace on the climb. I was still at my limit but not over my limit so I could come back in the descent and recover in Tejay's wheel a bit. Then we had a flat part and I could take a few breaths. In the last climb I said to myself "Now it's all in. I have Tejay with me" and it was perfect. I could see that he still had something left in the legs to do this last climb. Majka tried to attack me three times I think and I knew I had to follow. I was hurting so much in the final sprint but I knew what it was for. I gave it everything I had in my legs." What can you say about your teammates? "My teammates were all amazing. Like I said a couple of days ago when I won the stage, the confidence and trust they gave me was unbelievable. I'm still young but when these guys with so much experience and these palmares believe in you, that's an honor. They knew I was in second place yesterday and they did everything to put me in the lead and today they did everything to defend this jersey. It's amazing." You recorded your first professional victory less than two weeks ago and now you have five to your name. What can you attribute this to? "It's difficult to say. I showed already some good results in the last two years at hard races but I never had these results. This year in Wallonie I was really confident in myself and then two days before Poland, you hear you can be leader together with Samuel Sanchez, then you know the team believes in you also. I started to believe more and more in myself. I had a hard Giro d'Italia because I was a little bit sick before but after I recovered a lot, and I did a good altitude training camp. And now one success follows another success. I have made the step to become the winner I was in the U23." Sports Director, Max Sciandri: "I was sitting just behind the GC group so I could see everything that happened and it's really good to be there and see the race unfold from a tactical advantage. Short stages are hard to control. The roads are narrow and the descents are technical. When Dylan dropped we called Tejay van Garderen back and he paced Dylan pack. The guys were perfect. Dylan stayed as calm as you can be in that situation. Tejay did an amazing job. Rohan Dennis was amazing. The whole team was just incredible. The job we did yesterday set us up today. We got rid of Peter Sagan (Bora - hansgrohe) who, for me, was the biggest threat. We were lucky that UAE Team Emirates pulled today because they were going for the win with Rui Costa, so that saved us from a lot of work. When Rohan kicked in, we started to nail down the race and from there everything came together. It's amazing to finish the week like this, not just with Dylan's effort but the effort from the whole team." A break by 13 riders spent a long time driving the 7th and final stage of the Tour de Pologne (132.5 km) which started and arrived in Bukowina Tatrzanska), with Sagan a brilliant major player who was the last man to surrender to the chasing group of the men in the classification. Along the final climb with 3 km to go until the finish line, the World Champion was caught and passed by a crew of 9 contenders for the general rankings, a group Rui Costa lost touch with on the climb before Sciana Bukovina. The captain of UAE Team Emirates crossed the finish line in the first group of chasers to garner 10th place, 54” behind the winner Poels. The placement kept him in the Top 10 in the general classification, in overall 10th place, 1’22” behind Teuns, who is the new king of the Tour de Pologne. Sports Manager Orlando Maini, who led the squad with his colleague Daniele Righi, considered the team’s final tally in the Polish race. “We scored one win with Modolo, we were always there in the high ranks of the arrivals for every stage, and Rui Costa garnered a placement in the general classification’s Top 10. In terms of results we can be satisfied. The Binck Bank Tour starts August 7. Here are a couple of team updates. Formerly known as the Eneco Tour, the BinckBank Tour will again visit the Netherlands and Belgium for a seven-day race through the low lands from Monday, August 7 to Sunday, August 13. All Belgian and Dutch riders on the Cannondale-Drapac roster will take to the start in Breda for the first stage of the 2017 BinckBank Tour on Monday. Kristijan Koren and Irish road champion Ryan Mullen complete the line-up. “The profile of the race suits this group very well,” said sports director Andreas Klier, who will be directing along with Charly Wegelius. The BinckBank Tour will start with 169.8 kilometers of flat road racing, from Breda to Venray, in the south of the Netherlands. Stage two is a nine-kilometer individual time trial. It starts and finishes in Voorburg, just east of The Hague. 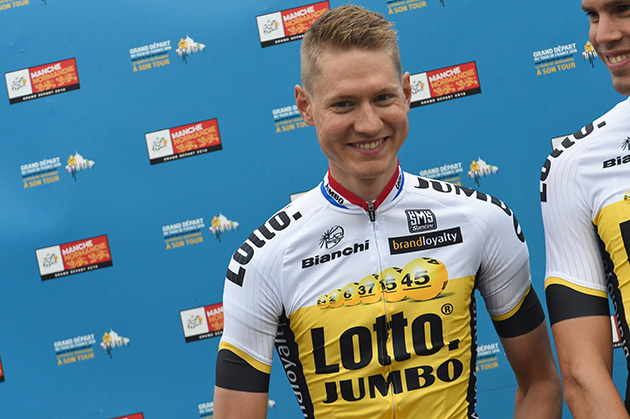 Because of the short distance, it will be an essential stage for any rider with GC ambitions, Klier believes. The race travels to Belgium in stage three, offering a 185-kilometer flat coastal road race on Wednesday. The peloton will encounter the first undulating roads on Thursday, in a 154.2-kilometer stage that starts and finishes in Lanaken. It’s back to the Netherlands in stage five, where the finish line will be drawn at the Tom Dumoulin Bike Park in Sittard-Geleen – the park that also hosted the very first Hammer Series back in June. The stage finish will be familiar for Dylan van Baarle, who came second in Sittard-Geleen in the 2015 Eneco Tour following a day spent in the break. The BinckBank Tour finishes with two stages in Belgium, both around 200 kilometers in length. The construct of the last day will make the race interesting until the very end. Stage seven includes a hilly closing circuit, a ‘golden kilometer’ at the 170 kilometer mark with three-two-one bonus seconds up for grabs, and a finish atop Muur van Geraardsbergen. 4 August 2017, Santa Rosa, California (USA): Greg Van Avermaet will return to racing at the Binck Bank Tour next week as he spearheads BMC Racing Team's General Classification ambitions at the UCI WorldTour race. Sports Director Valerio Piva believes that BMC Racing Team is taking a well-rounded team to the seven-day stage race. "We have seen year after year that Greg performs well here and it is the kind of race where he can target the General Classification so, he will be our leader next week. There are a lot of UCI WorldTour points on offer at this race which is also a motivating factor for him. I think we are taking a strong team that can perform on all levels at this race. Stefan Küng will be in good form after the Tour de France and we will see what he can do on the stage 2 time trial. This day could make a difference overall so I think Stefan will also be a protected rider. Traditionally, stage one is a sprinters' stage and for that we have Jempy Drucker while Michael Schär, who is coming out of the Tour also, Nathan Van Hooyondck, Loïc Vliegen and Manuel Quinziato are all great support riders for the team," Piva said. Van Avermaet is feeling confident as he heads back to the start line after narrowly missing out on a podium position in 2016. "I had good sensations at Clasica Ciclista San Sebastian and Binck Bank Tour is always a race that suits me. I just missed out on a spot on the podium last year so I am looking forward to racing here once again. I am feeling really motivated and it is always nice to be back racing in Belgium," Van Avermaet explained. The Vuelta a España starts August 19. I'm already getting team roster reports. On Saturday 19 August the Vuelta starts with a team time trial in Nîmes, France. These nine Lotto Soudal riders will take part in the last Grand Tour of the season: Sander Armée, Bart De Clercq, Thomas De Gendt, Jens Debusschere, Tomasz Marczynski, Rémy Mertz, Maxime Monfort, Rafael Valls and Jelle Wallays. It will be the third participation for Rafael Valls (30) in the biggest race of his country. Also for Jens Debusschere, who celebrates his 28th birthday during the Vuelta, it’s the third Vuelta of his career. His fellow countryman Maxime Monfort (34) is more experienced, he takes part for the seventh time. Rémy Mertz (22) is making his Grand Tour début. Jelle Wallays (28) did the same in last year’s Vuelta and he is part of the line-up again. Bart De Clercq, who turns 31 on 26 August, crashed in last year’s sixth stage and had to let go of his ambitions. He gets new opportunities in his sixth Vuelta. Sander Armée (31) returns to the Vuelta too. Just like for Tomasz Marczynski (33) this will be his third Vuelta. Thomas De Gendt (30) can get ready to join breakaways, he is riding the Vuelta for the fifth time. It’s remarkable that Adam Hansen is not part of the line-up, after eighteen consecutive Grand Tours. Adam Hansen's string of consecutive Grand Tours stops at 18. The final Grand Tour of the season, the Vuelta a España, is nearly upon us and Team Sunweb are pleased to reveal their long-list of 13 riders for the race. The 2017 edition is composed of five flat stages, one flat finish at high-altitude, eight uphill stages, five mountain stages, an individual time trial and a team time trial to open the race. With five potential Grand Tour debutants on the long-list, the Vuelta will become an important stepping stone for Team Sunweb's talent development for the future. Wilco Kelderman (NED) is a rider whom the team had already confirmed participation of during Team Sunweb's Launch at Münster-Osnabrück, Germany, last January. After crashing out of the Giro on stage nine with a fractured finger, the 26-year-old Dutchman prepares for his second Grand Tour start this year and will go to Spain to explore his opportunities for the overall, without pressure on results. Ahead of the race Team Sunweb coach Marc Reef (NED) said: "We have a good mix of riders on our long-list with a variety of skills that will be valuable in different types of stages and race situations. With our ambition in mind to explore our overall possibilities, we will need a team with time trial, climbing and Grand Tour experience to be competitive throughout the three weeks of racing. As always in Spain, the parcours are really challenging and we have been preparing over the past months extensively so we know exactly what to expect. "Coming off the back of a really successful Grand Tour season for Team Sunweb, we hope to continue the momentum in Spain and can use the extra knowledge and experience gathered during these successes to help us on our journey to Madrid."